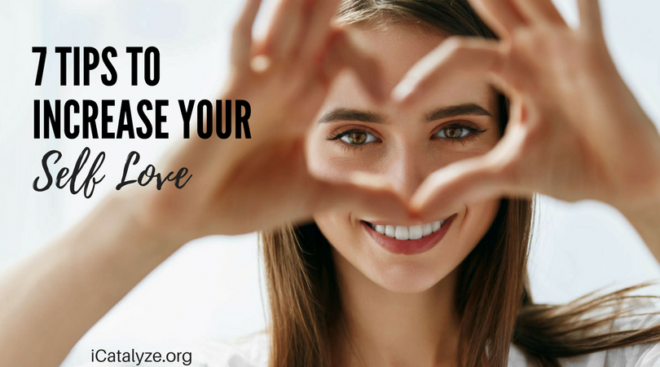 7 Tips to Increase your Self-Love - iCatalyze - Seeks to catalyze your potential! It seems that the phrase “self-love” is being talked about all the time, and everyone is a fierce proponent of it, but what does it really mean? It can mean different things for each person since we have different ways of showing love to ourselves. Yet, a more important question is why does self-love matter? Taking it one step further, self-love is not a feeling, but rather an action. It is a state of appreciation for oneself that grows from actions that support our physical, psychological and spiritual growth. So, self-love is a fundamental aspect of personal and professional development. And while it might seem like a “woo woo” topic, I’d say it is a crucial component of leadership. I can’t keep count of how many times I’ve had coaching clients telling me they don’t think they’re good/smart enough, they don’t have the courage to speak up, or they don’t trust in their abilities to face a certain challenge. Self-love is at the core of many of these situations and it influences the image you project at work and how you cope with problems. Mindfulness: Having an open, curious, non-judging attitude; not overidentifying with negative stories about the self. Self-kindness: Treating yourself kindly, rather than harshly. Extending the same care and support to yourself that you would to a good friend or loved one. Common humanity: Allowing yourself to be human, to make mistakes and learn from them. Knowing that as humans we are not perfect, nor should we be expected to act flawlessly. Become mindful. I always talk about the importance of mindfulness, and here’s yet another reason to try it! People who have more self-love tend to know what they think, feel and want. They are mindful of who they are and act on this knowledge, rather than on what others want for them. Practice good self-care. Taking care of your basic needs can help you love yourself more. Here’s where the spa day applies! But beyond that, nourish yourself through healthy activities, like good nutrition, exercise, proper sleep, intimacy and healthy social interactions. It can help to create a self-love ritual at some point in your day where you disconnect from technology for 15 minutes and give yourself some pampering. Set boundaries. You’ll love yourself more when you set limits or say no to work, love, or activities that deplete or harm you physically, emotionally and spiritually, or express poorly who you are. I know it’s easier said than done, but remember you are your own best advocate, so speak up. Build community. Surround yourself with people who build you up and truly care about you, and create a distance from those who do not. Life is too short to waste on people who want to bring you down. So, focus your time and energy on those people that will support you and help you stay motivated and on track. Give yourself a break. We have a tendency to be very hard on ourselves. Many times, while taking responsibility for our actions, we punish ourselves too much for mistakes. You have to accept your humanness (the fact that you are not perfect), before you can truly love yourself. Have some more compassion with yourself and practice being less hard on yourself when you make a mistake, and instead view it as an opportunity to learn and grow… we all go through it. Don’t compare yourself to others. It’s so easy to fall into the comparison trap. With the prevalence of social media, we can see celebrities and friends posting about amazing experiences or milestones and forget that they also have bad days. Remember that we are all at different stages of our journeys and we all have ups and downs. Instead, focus on the positive and what you are grateful for. Be your own coach. As you develop more mindfulness, you can “catch” yourself next time you have negative thoughts about yourself and acknowledge it without judgment. Then, you can guide yourself in a positive direction and tell yourself that you have other choices, and its never too late to change. You may consider a concrete step that you can take right away to move in a more positive direction or get up and try again. When you grow in self-love, you can accept your weaknesses as well as your strengths, have less need to explain away your short-comings, and have compassion for yourself as a human being struggling to find personal meaning. Not only will self-love bring you personal benefits, but it will also improve how you relate to others. If you choose just one or two of these self-love actions to work on, you will begin to accept and love yourself more. Which one will you try today?